Isn't this lovely? It is a map of South Asia, with the name of each region written in the dominant script of the region. It has some errors, noted in the Language Log post by Bill Poser from which I discovered it. When I heard Shabana Azmi and Javed Akhtar speak at Harvard, Shabana ji said, "A script is not a language," and Javed sahib agreed. This map highlights this fact, as many regions that share scripts do not share languages. 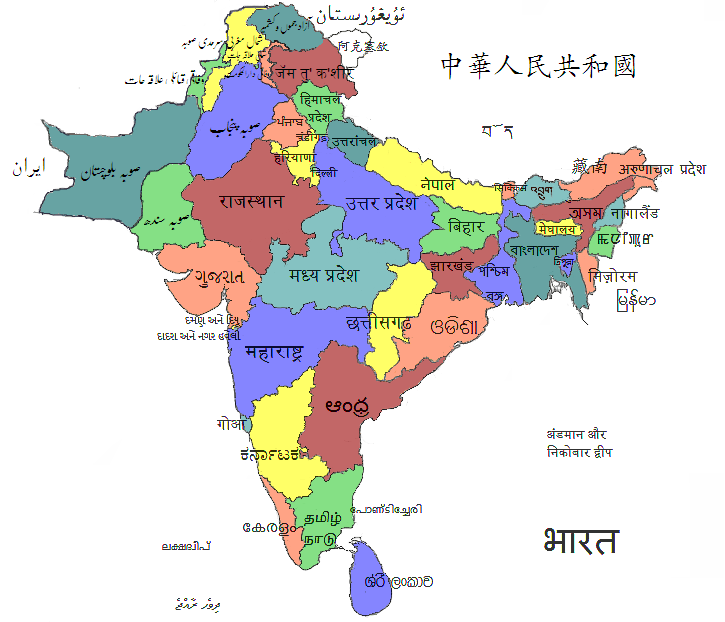 Marathi-speaking Maharashtra, Nepali-speaking Nepal, Hindi-speaking Uttar Pradesh, and Kashmiri speaking Jammu and Kashmir, just to name a few, all use Devanagari; how many languages are represented by the Arabic/Persian scripts to the north west? The map also makes my brain tingle at the thought of what to learn next. I've had a little book on Urdu script for months but I've been intimidated by it. Bill Poser is intimidated by the Sinhalese; I bet he can read Urdu. I've got to start catching up! So many scripts. I'd never heard of Manipuri before - it's the one in Manipur on the far left.